Bayshore Center at Bivalve - Bayshore Discovery Project - Delaware Bay Museum - AJ Meerwald - Are We There Yet? Formerly known as the Delaware Bay Schooner Project or the Bayshore Discovery Project, the Bayhsore Center at Bivalve forwards the mission of protecting the enivironment, history and culture of New Jersey's Bayshore region through education, preservation and example. The main vehicles for BDP's work include the schooner A.J. Meerwald and the Delaware Bay Museum. 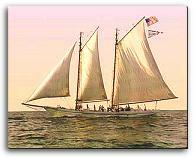 New Jersey's Official Tall Ship, the 115' historic schooner A.J. Meerwald is the centerpiece of Bayshore Discovery Project's programs. From April through November, this beautiful ship offers a busy calendar of Public Sails, exploring the natural resources of the Delaware Estuary and the coastal waters of New Jersey. Special Events, including dinners, concerts, holiday celebrations, educational sails, and other family activities, are available throughout the season. A typical trip lasts 2½ hours. During the summer months Schooner Day Camp offers a unique opportunity for youngsters to experience the sailing life. Call (800) 485-3072 for details. The Meerwald is also available for charter, and what a wonderful way to celebrate a birthday, wedding, or other special time! An up-to-date calendar and other news are available on BDP's official website. The Delaware Bay Museum houses Maritime Traditions of Delaware Bay, an exhibit that interprets shipbuilding, oystering, commercial fishing, and recreational uses of the bay. Hundreds of wooden schooners were built on bayshore shipyards, including Jersey Oyster Schooners like the Meerwald. A fine collection of photographs and artifacts depicts the richness and culture of these fine old days. Museum: Tuesday thru Saturday, 11am - 4pm. Meerwald: Sails spring thru fall. See calendar on official site for details. Admission: Admission to the Museum is FREE. Note: Price shown are approximate. Prices may be higher or lower depending on length of sail, port of departure, and other factors. Call or visit the official website, linked above, for further details. Charters are available for groups of all types. Groups: Groups of 10 or more with reservations receive a discount. Group Reservations: Groups should reserve a Museum visit a week in advance--more for the Meerwald. Individuals should also reserve a place on the Meerwald at least a day in advance. More, if possible. Lunch: Bagged lunch is permitted. Water bottle is recommended. Handicapped Access: Museum exhibits are accessible. No restroom facilities. Call with your specific needs. Directions: From the North: I-295 South to Rt. 42 briefly to Rt. 55 South. Proceed to the end of Rt. 55 to Rt. 47 East. At the 47/347 split, stay on 47 but make the first right and follow signs to Port Norris. In Port Norris turn right at the "T" onto Main St. Go 2 blocks to the Museum on the right. To go to Bivalve continue past the Museum and turn left at the next intersection onto High St. Drive approx. 1 mile to the Schooner Left. Via Garden State Parkway South: Take Exit 17 to Rt. 9 South to Rt. 83 West to Rt. 47, then follow Rt. 47 until you come to a Traffic light. At that light, turn left, following the signs to Port Norris and proceed as above.